You all know I’m a big proponent of using what you have, living green when you can, and not taking up a giant footprint on the earth. So how do you decorate your home and get a new look for under $50? I found these ideas on the Better Homes & Garden website, one of my favorite go-to places for budget-friendly decorating. 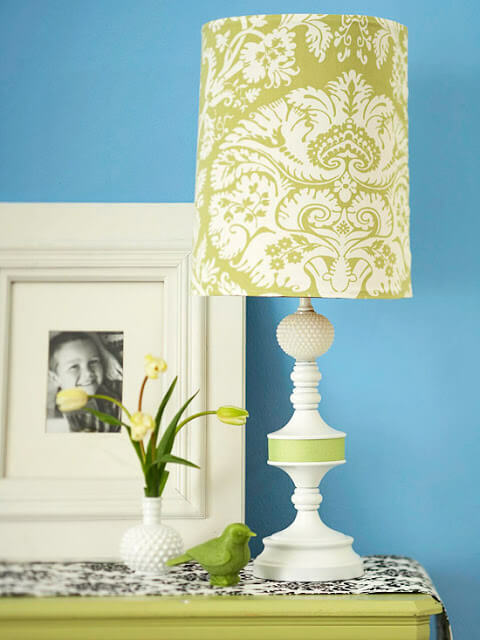 If a lamp is drab and boring, liven it up. Attach fabric or paper to transform the shade. 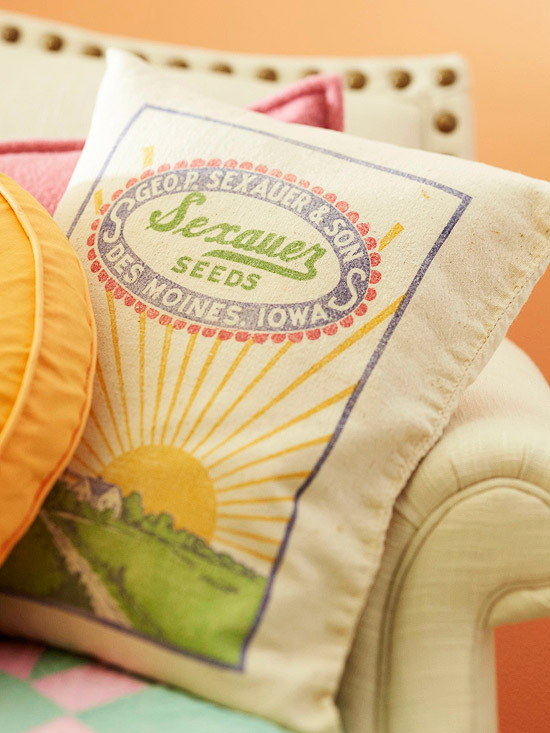 It doesn’t cost much to buy pillows, pillow covers or make your own pillows. It is a very fast way to get a totally different look. You might even just switch up pillows from other rooms. Wallpaper the backs of cabinets or shelves. This will utterly transform your space. Make little vignettes like the one above with just a dash of creativity. 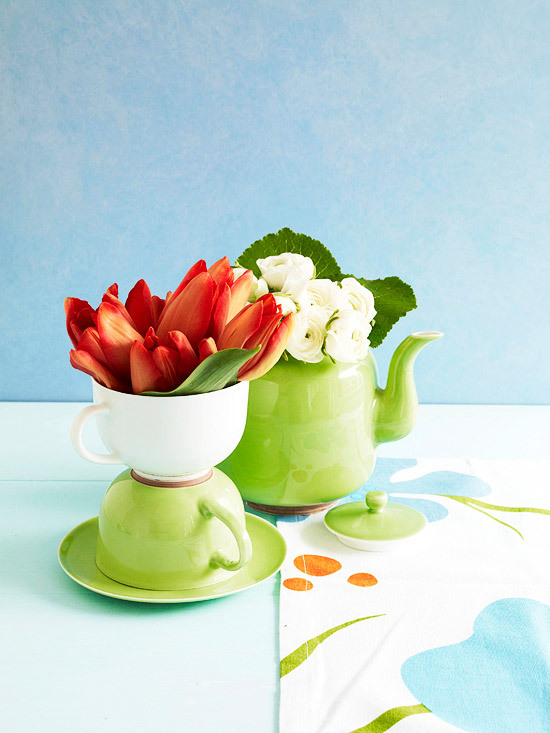 Turning one mug upside down gives it a whimsical look and added height. If you have an ugly lamp, prettify it with paint. 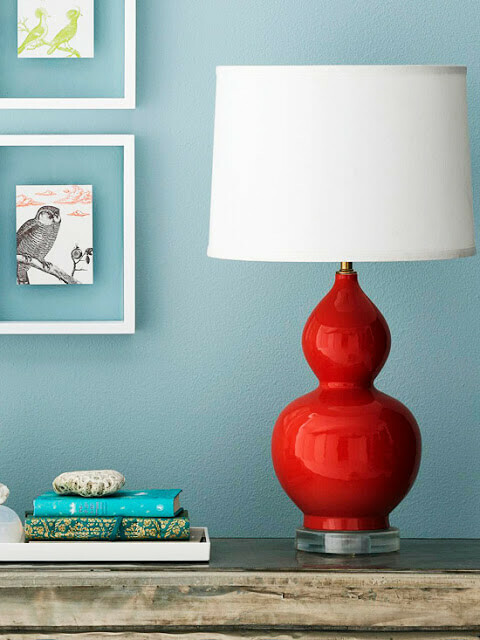 This glossy red paint takes this lamp to a whole new level. 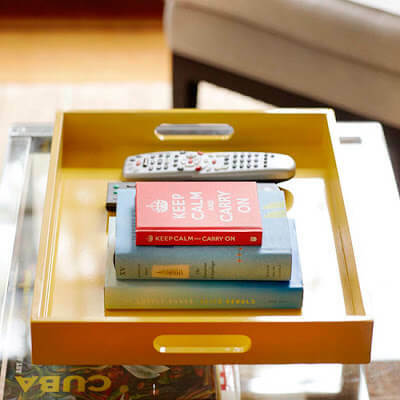 Is your coffee table or side tables a cluttered mess? Corral items in a tray. The look is elegant and tidy. You don’t need fancy art to bring your walls to life. You could print out old family photos, cut them in a circle shape, and tape them to the center of plates for a unique look. 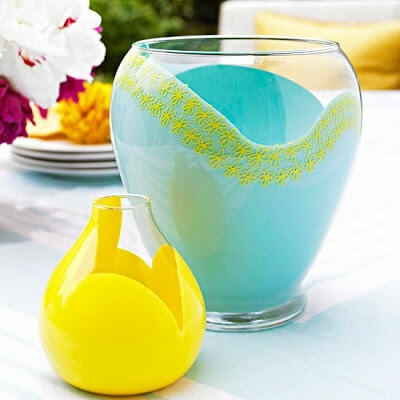 A cheap way to create table art is to take clear glass containers, pour some acrylic paint inside, and turn and swirl the paint around until you achieve the look you desire. If you have room (which unfortunately I do not) put your laundry detergent in clear vintage style glass jars. Add a pretty teacup or spoon to use for measuring. A way to make your bathroom take on new life is to get a new shower curtain. Or you could make one. This could be the start of a whole new look and bring new color possibilities into your small space bathroom. There are all kinds of ways to “decorate on a dime.” The best way is to shop your house. Or get together with some neighbors and do a bit of trading. Painting is your cheapest and most versatile friend. Let you imagination be your only limit when deciding how to beautify your home. I love the graphic on that grain sack pillow. I am looking for some inexpensive grain sack towels for making pillows on my window seat. I am actually in the middle of pillows now! : ) Not new pillows…just making some covers for the older ones. ( Envelope closure which is the extent of my ability right now ) I am on my third one, two to go down the line. amei suas sugestões. Também penso como você decorar com pouco dinheiro e muito bom gosto. I am all for saving money, and loved the ideas you presented. 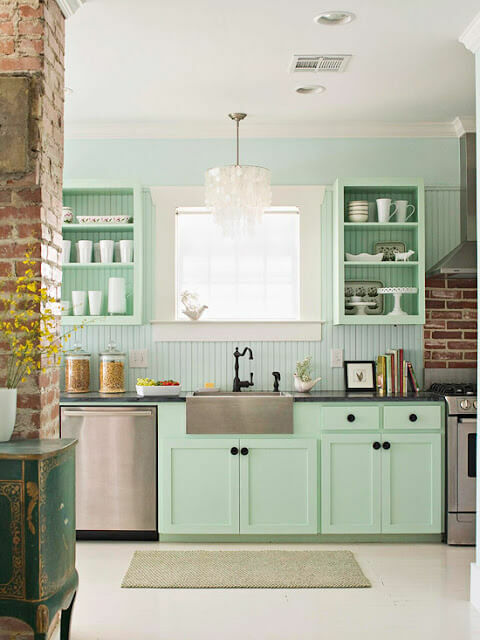 I am a painting fool and I think paint alone can make such a dramatic difference in a room. These sure are some great ideas! I'm in love with that kitchen and that cute little feedsack pillow. Great tips and I must say the lampshade tip really caught my eye-those 2 pink vintage lamps of mine, with the plain lampshades, are going to get a makeover soon! 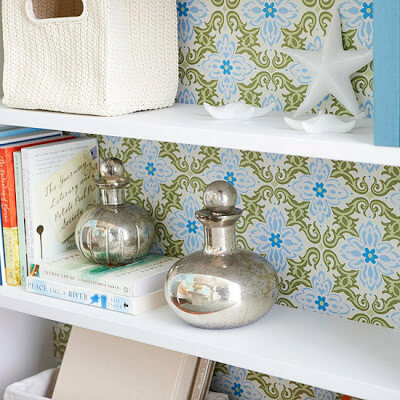 All great ideas Brenda!Love using the wallpaper/giftwrap backed shelves myself! Wonderful ideas Brenda, thanks for sharing so many good ones. 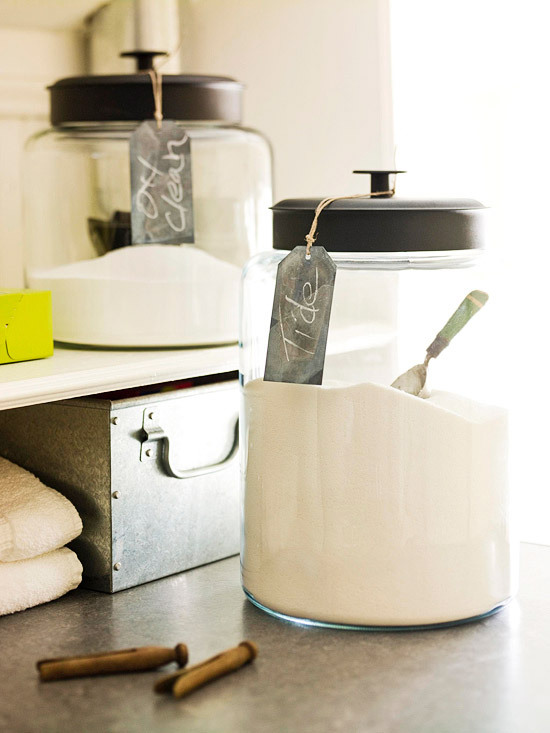 I really like the acrylic paint in the clear jars and the feed sack pillow is so cute! The first lamp makeover is so cute. Great ideas and I like your comment about the "giant footprint"….seriously! 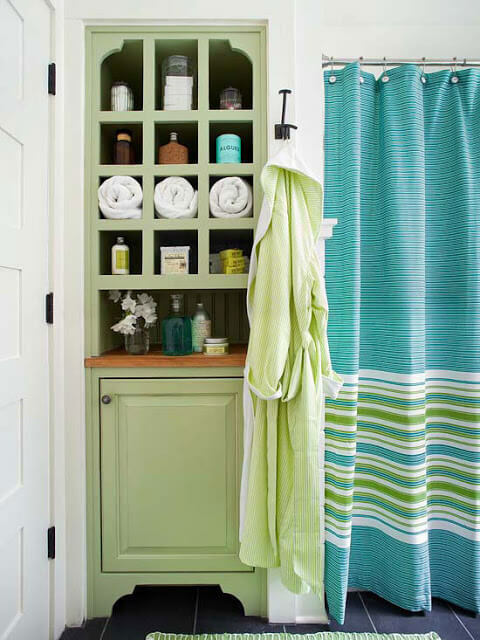 Love that green & blue bathroom!! Wonderful ideas. I need to update my lamps with paint and fabric now! 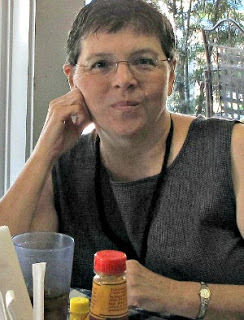 Brenda, all great ideas and many I have used over the years as well. Another tip I use, having limited space for storage I made pillows and then covers out of inexpensive fabric, I can the slip a cover on the pillows to change the look for the season or holiday. 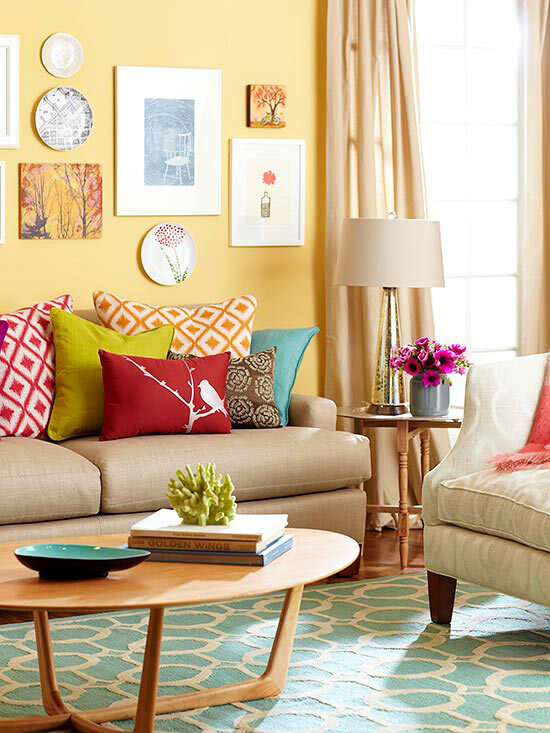 I LOVE LOVE LOVE the living room yellow color and color pallet. Can you share what brand/color of yellow paint you used?